The somewhat large, ocean-going mammal known as a Narwhal (Monodon monoceros), or Narwhale if you simply must have the “e” at the end, is a species of whale that spends most of its time trying to stay warm in Arctic waters. Any jerk with at least one working eye can see that the distinguishing feature of a Narwhal is the long horn protruding from its face. As Ishmael mentioned, this long horn is actually not a horn at all, but rather a tusk or tooth. Usually, it is the male who sports this rather daring bit of dental craziness, but occasionally females have one as well. Though it’s tempting to assume that Narwhals use these tusks for fighting, displays of dominance, breaking up ice, or making kebabs, it’s been recently discovered that they are actually sensory organs. The tusks lack the enamel most mammals have on their teeth, and this enables the them to act almost as filters. Narwhals are able to use their tusks to determine the water quality, the presence of food, and even the presence of nearby females looking for romance/to get knocked up. While not technically an endangered species, the somewhat mythic, elusive, fascinating Narwhal is a threatened one, its population affected by human hunting and the increasing ravages of climate change. 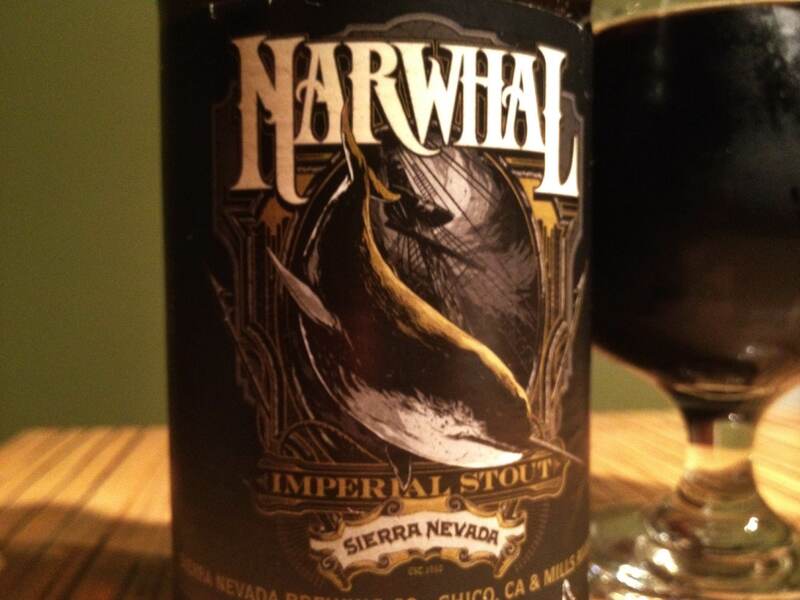 The somewhat high-alcohol, dark-as-the-night Imperial Stout from Sierra Nevada Brewing Co. known as Narwhal, is a somewhat high-alcohol, dark-as-the-night Imperial Stout from Sierra Nevada Brewing Co. Released yearly in the early Fall, Narwhal is a relatively accessible entry in an arena filled with much more highly anticipated, highly coveted, more expensive special/limited edition brews. The Nose: Nice, robust, sweet notes of roasted and toasted malt dominate, there’s even with a faint wisp of that roasting smoke swirling around. Nutty dark chocolate brownies and well-creamed coffee, perhaps even a bit of coffee liqueur. There’s a faint lactic quality to this as well, warm chocolate milk perhaps. Subtler hints of vanilla bean, pine-y hops, clove, and cherry cough drops. The Palate: Quite sweet, almost syrupy smoooooth. As with the nose, there’s not much trace of the 10.2% alcohol. Again, lots of roasted malt and sugar & creamed coffee. Much more dark chocolate here than on the nose, like chocolate sauce over vanilla ice cream. Towards the end, those slightly bitter, piney hops show up again along with some Mexican chocolate and vanilla syrup. The Finish: Quite sweet…sticky-lips sweet. More roasted malt, more coffee, more Mexican chocolate, a bit more hops before it fades somewhat quickly. Thoughts: Very good. Narwhal seems to fly under the radar a bit. It’s relatively cheap, relatively easy to find, and relatively easy drinking. I say “relatively easy drinking” because, man, is this stuff is sweet. Personally, I found it a bit too sweet, though I also found many other redeeming qualities which sold me on it. I liked the malt forward flavor profile and thought within its sweetness, it was balanced and smooth. Certainly not to be missed if you’re a fan of the style, just bear in mind the almost cloying sweetness demands that you take your time with this one.